First Person Arts, a local nonprofit organization that celebrates the power of the personal through storytelling, hosted its Grand Slam event Nov. 7 at Christ Church Neighborhood House in Old City. This particular Grand Slam happened to coincide with the end of First Person Arts’ 12th season. Grand Slam events are the culmination of a year’s worth of StorySlams. 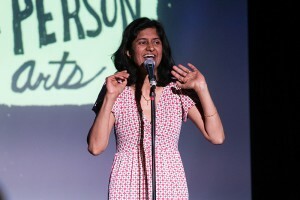 Eleven finalists from the season told five-minute stories to a sold-out audience. A StorySlam is an invitation to share five minutes of one’s life with a room full of people. At StorySlams, anyone whose name is chosen has the opportunity to get onstage and tell a story. Each night features a new theme, so the stories and the storytellers are always changing. Stories are judged based on the storyteller’s ability to narrate a believable story that stays true to the theme, has a structured order and is under five minutes long. Anticipation hung heavy as the audience entered the venue. Outside, First Person Arts’ volunteers were selling beer and other snacks, and it was clear that everyone was ready to be wowed. For this year’s Grand Slam, the theme was “dilemma.” Stories included having to make the choice of whether or not to cheat on one’s spouse with an old friend, wrestling with the idea of getting an abortion, the decision of whether or not to lock a known claustrophobic in a room during a robbery, and the idea of returning home as an adult to one’s heroin-addicted parents who have found Jesus. The winning storyteller told a tale about wanting to live alone while also having a fear of dying alone. Some storytellers make a living by crafting stories as professional writers, college professors, primary school teachers, or directors of film and video. Others do not have a traditional storytelling occupation. What they all have in common, however, is the ability to convey a well-told tale. First Person Arts was founded in 2000 as a response to the growing interest in memoir and documentary art. The organization hosts StorySlams throughout the year at World Cafe Live on the second Monday of each month and at L’Etage at 6th and Bainbridge streets on the fourth Tuesday of each month. The 13th season begins Monday, Dec. 9. Additionally, First Person Arts hosts classes and workshops. Professional artists in storytelling, music, comedy and more are brought in to share their incredible stories from real life for the First Person Arts Presents series. In addition, there is a program called Edible World that lets guests savor amazing cuisine while hearing tales inspired by that food. For more information on upcoming events or to find out more about First Person Arts, visit http://firstpersonarts.org.